As Stewart Paterson at the Daily Mail offers a piece on an ISIS knife attack in Paris. 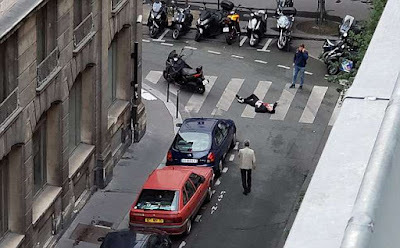 An ISIS knifeman who was shot dead by police shouted 'Allahu Akbar' as he rampaged through a central Paris district, killing one and injuring four others. The attack unfolded near the city's main opera house in an area full of bars, restaurants and theatres which were brimming on a weekend night. The man attacked five people with a knife, one of whom died, while shouting 'Allah Akbar', according to witnesses.